The Department of Fisheries, Western Australia is responsible for the sustainable development of aquaculture in the state. The major marine species currently under commercial aquaculture production in WA include pearl oysters (South Sea and black pearl), mussels, barramundi, abalone. Non-marine species include marron, yabbies, silver perch and aquarium fish. Marine micro-algae are also grown on a very large scale for the production of beta-carotene. Other species which could be farmed commercially include prawns, rock lobster, brine shrimp, and finfish species, including mahi mahi, tuna species and yellowtail kingfish. There are also opportunities to develop biotechnology products, such as commercially valued bioactive chemicals sourced from algae sponges, and other marine invertebrates. Aquaculture also has the capacity to yield benefits for Aboriginal communities through the restocking of trochus on the Kimberley reef flats. In the 2006/07 financial year there were 457 licensed aquaculture producers in Western Australia. The farm gate value of aquaculture production in WA (excluding marine algae and pearl oysters) was over $6.7 million. The most valuable industry sector was mussels ($1.8 million), followed by marron ($1.6 million), yabbies ($1.3 million), silver perch ($0.32 million) and barramundi ($0.31 million). Western Australia has a valuable and successful pearling industry, worth around $200m annually, and is the world's top producer of prized silver- white South Sea pearls. Wild pearl oysters are collected by divers in waters off the WA coast between Cape Leveque and Exmouth. The pearling industry is carefully regulated in WA - licensees have strict quotas (the entire industry currently has an annual quota of 572 units, with the value of one unit normally 1,000 shells), shells must be a minimum size of 120 mm, and collection zones are designated. The purpose of quotas is to ensure sustainability of wild stock and optimise value to the community by maintaining prices. The industry can also plan long-term operational and marketing strategies with an expectation of stability. The Aquaculture Council of Western Australia (ACWA) is the State's peak aquaculture industry body. ACWA prides itself on being a member driven organisation who works on behalf of its members to create benefits that ensure a profitable future for its members and a viable future for Western Australia's aquaculture industry. Presently, ACWA's membership represents over 90% of both the current and future industry earnings of the Western Australian aquaculture industry, and consists of Institutions, Corporatations, Aquaculture Sector Associations and individual members. 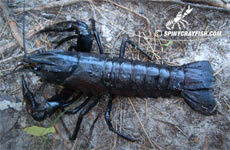 Large freshwater crayfish found in the south-west corner of Australia.